Hidden in a steep valley of dense Atlantic rain forest, Morretes (pronounced ‘mo-HET-ches’) is a tropical paradise seldom seen by outsiders. This village of some 15,000 residents looks largely the way it did when it was founded in the 18th Century: colonial-era churches, cobblestoned promenades, the Ponte Velha bridge connecting two sides of town bisected by the lazy Nhundiaquara river. This isn’t the big-city Brazil you’ve been promised in postcards. It’s something far sweeter than that. And it’s got the sugarcane fields to prove it. 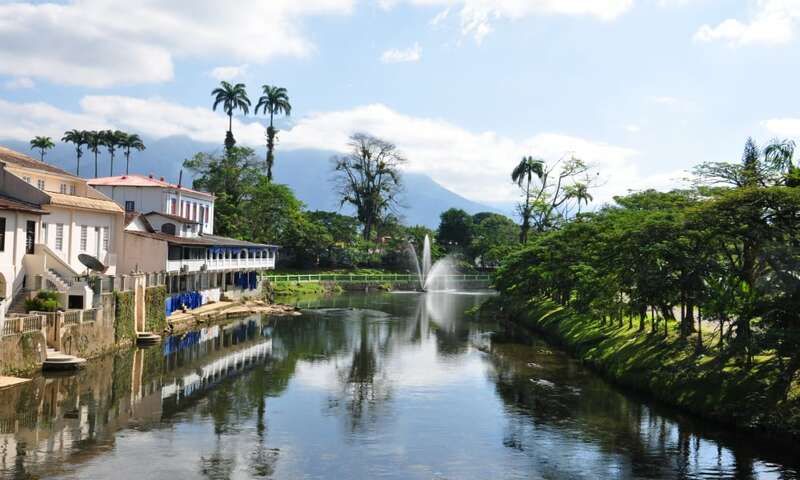 The primary export of this quiet enclave is a globally recognized spirit known as cachaça. Although frequently mischaracterized as rum, the native liquor is actually distilled from fresh sugarcane juice. This teases out earthier, more savory notes than the sweeter, molasses-derived liquid of its rum counterparts. Along the outskirts of town, up an unpaved dirt road, is the home of Novo Fogo. Today, it’s one of the most popular purveyors of cachaça in the U.S. But when opening the distillery, founder Fulgencio Torres Viruel set out with only a modest goal in mind. “When we decided to start the production of Novo Fogo in Morretes, our desire was to lead other people to try this drink that is special to us,” he said. He pursued only traditional methods, sustainably farming sugarcane from his own backyard and running it through copper pot stills to land on a product tasting far cleaner and craftier than the larger industrial varieties from the big city. He wasn’t re-inventing the wheel, though: “Cachaça has been produced in Morretes since the 18th century,” Torres Viruel points out. His particular innovation was in marketing the humble, hand-made virtues of the local spirit to an international audience thirsting for it. We feel saudade for Single Barrel Cachaça. "Saudade" (sah-oo-dodgy) is a famously Brazilian emotion that is hard to translate directly. It is kind of like nostalgia, a sad yearning for something or someone that once brought you joy but now is gone, yet through the melancholy memory you're enlivened again. When Single Barrel Cachaça is gone, it's gone forever, but it accompanied such good times. Back in the town square, the spirit is seen on countless dining tables crowding the banks of the river. At boisterous restaurants like the aptly named Ponte Velha, patrons sip on caipirinhas – Brazil’s national cocktail, combining cachaça, sugar, and lime – to beat back the sweltering jungle humidity. Although you’ll find the drink served anywhere in this country, it seems perfectly suited to the laid back, rural charm of Morretes. It’s paraded openly in the streets on Carnival, when this entire community celebrates the start of Lent with jubilant song and dance. It’s central to just about any sort of ceremony or ritual around here. In a more daily setting, the cocktail is also a perfect foil to the town’s local cuisine: barreado. It’s a shredded beef stew, simmered overnight in a clay pot with tomatoes, onions, and Brazilian spices. Prior to serving, waiters mix in cassava flour, congealing with the broth to form a hearty, gravy-like paste. It’s served with plantains and rice. It might seem like an odd choice for such a sticky climate, but the locals label it as comfort fuel. “It is a dish that will give you energy for the entire day,” exclaims Torres Viruel. No restaurant could survive around here without its own rendition, although some prepare it more convincingly than others. Restaurante Madalozo and Casarão are perennial contenders for best in town. Harvest time is getting close! Even with its commitment to the past, Morretes has allowed some trappings of modern culture to seep through the cracks. The town now supports a nascent craft beer scene, thanks to the arrival of Porto de Cima in 2014. Its colorful arrangement of styles, including a kölsch brewed with passionfruit, are all bottled under the shadows of Pico Do Marumbi – a 5,000 foot outcrop rising from the valley floor. The American ex-pat behind the brewery, along with his wife, also operate Pousada Graciousa, a recently renovated bed and breakfast across the street. May 27 in Brazil is recognized as Dia da Mata Atlântica, or Day of the Atlantic Forest. This incredible biome is home to tens of thousands of plant and animal species, yet over 85% of its mass has been destroyed. 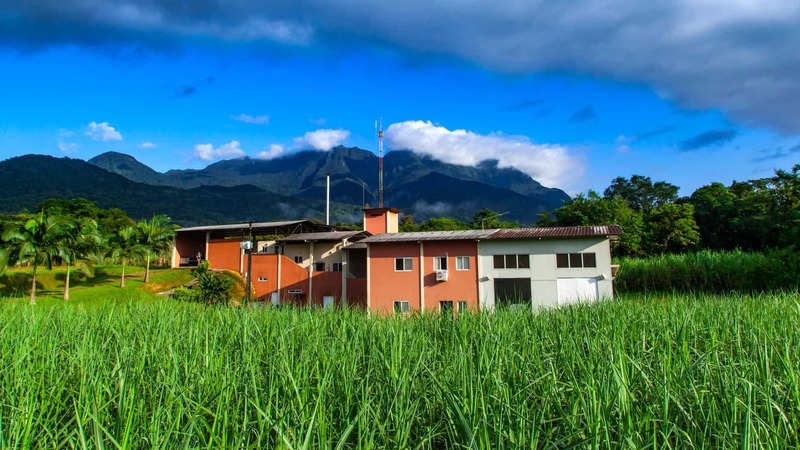 This is our home—seriously, just look at how close our sugarcane is to the forest! It’s why we’re committed to a reforestation project in our part of the Atlantic Forest to bring it back to its original state by planting native trees. Viva a Mata Atlântica! For his part, Torres Viruel through Novo Fogo has invested heavily in reforestation efforts. Although the town is surround by the largest continuous area of Atlantic rainforest in all of Brazil – it has been receding for generations, and is under constant human threat. Accessed by the Serra Verde Express, upwards of 150,000 visitors a year are carted here on the hour-long train ride from the state’s capital city of Curitiba. So while other villages and regions across Brazil might actively court tourism, Morretes thrives on remaining somewhat off-the-beaten path. Indeed, it is the town’s greatest asset. If you’re lucky enough to make it to this part of the world, cherish it; tread lightly, share your secret with only those you trust and enjoy the cachaça responsibly.